A southwest Iowa native is helping to train the crew of what’s touted to be one of the U.S. Navy’s newest and most sophisticated warships. Chief Petty Officer Bobby Houseman of Winterset joined the Navy in 1997, in part, out of respect for his grandfather, who also served. 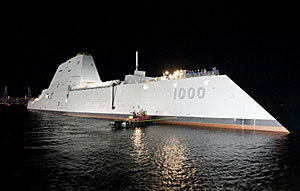 The 35-year-old Houseman is stationed on a destroyer called the Zumwalt. It’s still being outfitted at the Bath Iron Works on the coast of Maine. While it’s 80 feet wide and more than two football fields long, the huge ship was built using the latest in stealth technology. “It has reduced our radar signature down to approximately a fishing boat,” Houseman says. When at sea, he says the Zumwalt will perform a variety of missions, including attacking targets on land with gunfire and cruise missiles, hunting and tracking submarines, airspace surveillance and support to special operations forces. 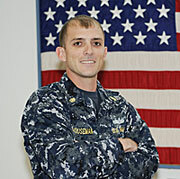 Chief Petty Officer Robert Houseman. The ship’s two enormous main guns can hit targets at a great distance with incredible accuracy. “They shoot a long-range rocketed projectile,” Houseman says. “These projectiles can go approximately 63 nautical miles and really, if you threw a belt buckle out there, they’ll remove that belt buckle from the map.” The Zumwalt’s futuristic appearance and capabilities seems fitting — given the name of its commanding officer. Science fiction buffs know the commander of the starship Enterprise on “Star Trek” is Captain James Kirk, and his future birthplace is Riverside, Iowa. Like the science fiction hero, Houseman says this warship is commanded by a very-real person of the same name. The Zumwalt was named in honor of Admiral Elmo “Bud” Zumwalt Junior, who served as Chief of Naval Operations, the Navy’s most senior uniformed officer, from 1970-1974. The ship should be commissioned and set sail next year.